Author note: Frozen cherries also work with this recipe. However, make sure the cherries are thawed. Remove the cherry stems. Pit and quarter the cherries. Place in a bowl. Add the salt, sugar, honey, lemon zest and lemon juice to the cherries. Stir well. Spray a rimmed baking sheet (or two baking sheets) with canola oil. Lay the puff pastry onto a floured surface (do not roll out the puff pastry) and cut into four equal squares. Place the squares onto the baking sheet, arranged in a diamond. Add two slices of brie cheese (lengthwise) in the middle of the puff pastry. Spoon a generous amount of cherry filling over the top of the cheese, from one end of the diamond point to the other. Top with a sprinkling of sugar and honey. Take the other two ends of the puff pastry and fold them towards the middle. Secure the ends tightly by pressing one dough end over the other. Continue this process until all eight pieces of dough are filled. Lightly brush each side of dough with egg wash. Sprinkle more sugar onto the tops of the dough. Place in the fridge and let cool for 15 minutes. Remove the sheet pans from the fridge and place into the oven. Bake for 35-40 minutes, or until the pastry is golden brown. Remove the sheet pan from the oven. Let cool for 2 minutes. Drizzle additional honey on top of the pastries. Remove the pastries from the pan and place onto a cooling rack. Serve warm or at room temperature. 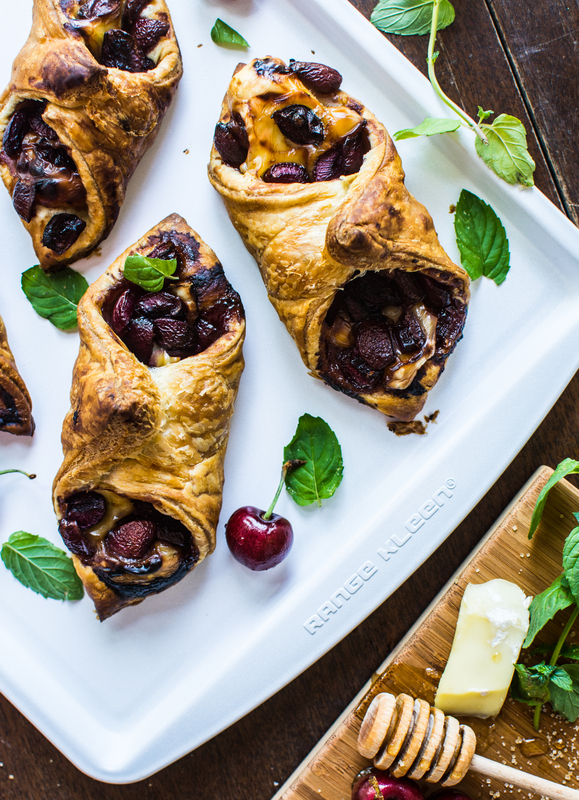 This entry was tagged A Pleasant Little Kitchen cherry and brie honey puff pastry, A Pleasant Little Kitchen cherry recipes, baked brie with cherries, cherries, cherry and brie, cherry and brie honey pastry, cherry puff pastry, easy summer puff pastry, puff pastry recipe, summer puff pastry. Bookmark the permalink.